The European Union told Britain it could have a different kind of Brexit deal after its parliament overwhelmingly rejected the one negotiated by Prime Minister Theresa May -- but only if London changes its key demands. 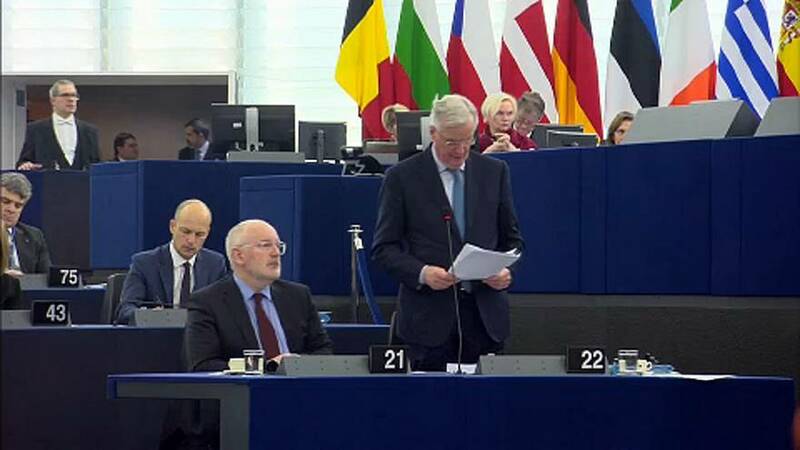 Addressing the EU Parliament in Strasbourg, EU chief negotiator Michel Barnier defended the agreement struck with May that was crushed the previous evening by British lawmakers. He warned that the risk of a disorderly withdrawal was now greater than ever. The EU executive would step up its preparations, he said, for a disorderly exit that would disrupt the whole of Europe. Barnier indicated that one way forward would be for Britain to accept even closer alignment with EU regulations to secure a very close trading relationship in the future -- EU officials say London could, for example, abandon its determination to leave the EU customs union and centrally regulated single market. "While we understand the UK could need more time, for us it is unthinkable that article 50 is prolonged beyond the European Elections," said Guy Verhofstadt, the EU parliament's Brexit coordinator. And then there is the possibility of a second referendum, something hard-core Brexiteers did not seem to fear, at least not in public. Said Ex-UKIP leader Nigel Farage: "The British may be a very placid people, very laid back but I promise you: if they get pushed too far it's a lion that will roar. We will be even more defiant if we have to fight a second referendum and we will win it b y a bigger majority,"
EU Commission vice president Frans Timmermans said it "pained" him to see the United Kingdom as politically divided as it is today. He reiterated that Brexit "will do harm" to both the UK and the European Union, but that politicians must act to minimise that harm. "Let me stay close to home and quote the Rolling Stones. You can't always get what you want, but if you try, sometimes you might get what you need." What's been the reaction to Theresa May's Brexit deal defeat?